Sushi is now on the menu for theInternational Space Station (ISS), thanks to Japanese astronaut Soichi Noguchi. Heand Russia's Oleg Kotov and NASA's Timothy Creamer took off from the BaikonurCosmodrome on Dec. 20 with a fresh load of raw seafood. "Wehad training in Japan and I trained [my space colleagues] to be sushi lovers,so I am going to make a couple of flavors of sushi," Noguchi told a pressconference before launching to the station this month on a Russian Soyuz spacecraft. 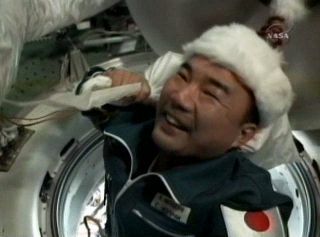 "Some sashimi, andraw fish and sushi and I will bring that up to the space station to share withmy crew," he said, according to the space news Web site Red Orbit. Earlier in the month,Creamer told reporters, ?We can?t wait for when Soichi makes us sushi!? ForCreamer, a US Army colonel and NASA engineer, this mission will be his firstflight to space. Better than Tang, you say?Probably, but the international flavor of the ISS crew has already lead to someunusual menu items, like tinned perch, curds with nuts, and beetroot soup(borscht) sucked through a straw from a plastic bag. "Indeed theinhabitants of the new star could not live without eating, and their stomachswere suffering from the imperious laws of hunger. Michel Ardan, as a Frenchman,was declared chief cook, an important function, which raised no rival. The gasgave sufficient heat for the culinary apparatus, and the provision boxfurnished the elements of this first feast. "The breakfast began withthree bowls of excellent soup, thanks to the liquefaction in hot water of thoseprecious cakes of Liebig, prepared from the best parts of the ruminants of the Pampas. To the soup succeeded some beefsteaks, compressed by an hydraulic press, as tenderand succulent as if brought straight from the kitchen of an Englisheating-house. Michel, who was imaginative, maintained that they were even"red." "Preserved vegetables("fresher than nature," said the amiable Michel) succeeded the dishof meat; and was followed by some cups of tea with bread and butter, after theAmerican fashion. "The beverage was declaredexquisite, and was due to the infusion of the choicest leaves, of which theemperor of Russia had given some chests for the benefit of the travelers. "And lastly, to crown therepast, Ardan had brought out a fine bottle of Nuits, which was found "bychance" in the provision-box. The three friends drank to the union of theearth and her satellite. "And, as if he had notalready done enough for the generous wine which he had distilled on the slopesof Burgundy, the sun chose to be part of the party. At this moment theprojectile emerged from the conical shadow cast by the terrestrial globe, andthe rays of the radiant orb struck the lower disc of the projectile directoccasioned by the angle which the moon's orbit makes with that of the earth."